Find out your financial personality! (Financial Perspective Questionnaire). Are you a Saver, Spender, Giver, or Investor? How does your financial personality, revealed by these four purposes of money, affect your financial future? What are the rewards and risks of each and what does Scripture have to say about them? In Money on Purpose, financial advisor and minister Shayna Lear presents a quiz to help you discover your own financial type. She then offers practical and faithful strategies to restore a healthy and faith-filled balance to your financial life. This candid and conversational book is written especially for African Americans, but offers insight and instruction for everyone struggling to be a faithful steward. Also available! 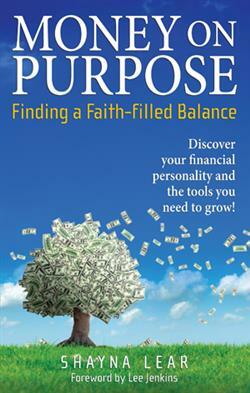 Money on Purpose Facilitator's Guide for Small Groups. FREE when you order five or more copies of the book! Enter code MOONPU in the discount box at checkout. Note that you must still add the Facilitator's Guide to your shopping cart to receive a link to the download. Shayna Lear (Philadelphia, PA) is a Certified Financial Planner and Chartered Financial Consultant with more than ten years of financial services experience. Presently she is enrolled in the Master's in Divinity and Master's in Economic Development programs at Palmer Seminary and Eastern University respectively.